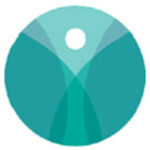 IHPC maintains this archive of recent policy-related documents, letters, and information materials for reference and for easy access to many of the foundational documents created during the early 2000s when IHPC was created and began the collaborations with other complementary, holistic and integrative health organizations that continue today. For questions about these and other documents — if you are a provider, policy specialist, reporter, researcher or healthcare organization — please get in touch with us at info@ihpc.org. Draft recommendations have 90-day public comment period, until March 28, 2019. The Pain Management Best Practices Inter-Agency Task Force (Task Force), in a draft report issued Dec. 28, 2018, is calling for individualized, patient-centered pain management to improve the lives of millions of individuals who experience acute and chronic pain. Members of the public will have 90 days to provide comments on the draft report’s proposed recommendations. IHPC is calling for our members to provide comments to The Task Force that will be recorded in the Federal Registry. This is an opportunity to have a strong voice in patient-centered, whole-person integrative pain management care. Read the draft report and leave your comments here. The Task Force, a federal advisory committee, was established by the Comprehensive Addiction and Recovery Act of 2016 – PDF to propose updates to best practices and issue recommendations that address gaps or inconsistencies for managing chronic and acute pain. The Task Force is composed of 29 members, including healthcare providers and patients, as well as federal employees. It is overseen by the U.S. Department of Health and Human Services, in cooperation with the U.S. Department of Veterans Affairs and the U.S. Department of Defense. Congressionally mandated review of the Centers for Disease Control and Prevention (CDC) Guideline for Prescribing Opioids for Chronic Pain. “Chronic pain affects an estimated 50 million U.S. adults or 20 percent of the adult population. An estimated 19.6 million U.S. adults have experienced high-impact chronic pain, which the CDC defines as pain occurring and interfering with life or work activities most days. This draft report offers a wide range of treatment modalities with a framework to allow for multidisciplinary, individualized patient-centered care,” said Vanila M. Singh, M.D., MACM, Task Force chair, and chief medical officer of the HHS Office of the Assistant Secretary for Health. “We encourage members of the public to review the draft report and share their comments with us.” See below for webinar on The Task Force from Drs. Vanila M. Singh and Shari Ling. The Task Force members have significant public- and private-sector experience across the disciplines of pain management, patient advocacy, substance use disorders, mental health and minority health. For more information on the Task Force, visit its webpage. 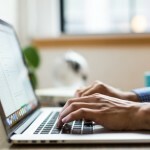 The CMS Innovation Center, CMMI, has been funding new models of payment for its Medicare and Medicaid beneficiaries in the last several years, through an Alternative Payment Model (APM) program that solicits the applications of clinical enterprises across the country. Regrettably, few have come from the integrative clinical community, which has been historically separated by rules. IHPC’s guidance to CMS asks that the agency makes sure that existing restrictions on payment for the services of licensed providers be waived in order to give its beneficiaries access to care that is readily available on the market. Click on the headline above for a PDF copy of the letter signed by IHPC Chair Len Wisneski, MD. The Attorneys General from 37 states, through their National Association of Attorneys General, NAAG, have co-signed a letter to America’s Health Insurance Plan, AHIP (the trade association for private health insurers), requesting that their members expand reimbursement for healthcare providers so that all licensed non-pharmacologic pain management options are available to treat chronic and other pain conditions. IHPC’s Press Release (click the title above) affirms the critical importance of this action. It is the latest in a crescendo of demands from the nation’s most important medical professional, standards and regulatory bodies to remove the barriers to full and comprehensive pain treatment. The default option remains the use of other drugs, under the practice of “Medication-assisted Treatment” (MAT), which has yet to prove effectiveness as an alternative approach. Many are calling the opioid crisis an emergency. Numerous task forces, practice guidelines from both professional organizations and governmental agencies, the Joint Commission and the former Surgeon General’s Turn the Tide Campaign recommend non-pharmacological approaches to pain. 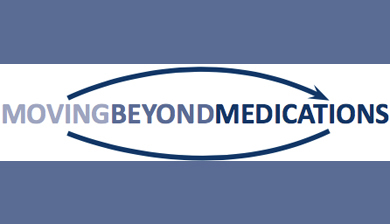 Moving Beyond Medications is a new campaign from the Integrative Health Policy Consortium and its partners that recommends non-pharmacological approaches as first-line pain treatment. It recommends opioids be considered only if these and non-opioid treatments are ineffective. A new Pocket Guide for Non-Pharmacological Approaches to Pain Management and Well-Being expands on these recommendations to help primary care clinicians and their patients with this approach. Download the Guide today to share with health professionals and the public. IHPC has responded to the FDA’s draft for an “Education Blueprint for Health Care Providers Involved in the Management or Support of Patients with Pain“ with specific recommendations for educating practitioners about the non-pharmacologic treatment options that FDA has acknowledged in its plan. Using more Comparative Effectiveness Research (CER) methods that can be especially affirming in measuring the real-world impact of integrative health approaches. The extensive comments offered here provide a useful comparison between the current and growing presence of integrative disciplines in US healthcare and the research agenda proposed by NCCIH for its next five years. Noting that “The crisis in Flint, Michigan is the tip of the iceberg,” the IHPC in February launched the Flint Michigan Initiative in order to recommend proven integrative approaches into treatment protocols. The task force is co-chaired by IHPC Chair Len Wisneski, MD and Dr. Gail Christopher, Vice President of the Kellogg Foundation, and includes participation by several integrative health organization leaders. This document is IHPC’s letter entitled “Comments on proposed 2016 Guidelines for Prescribing Opioids for Chronic Pain” to the Centers for Disease Control and Prevention (CDC). IHPC strongly endorses an evaluation of the Guidelines by the American Academy of Pain Management (AAPM). 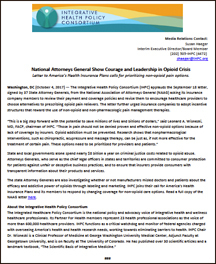 The letter summarizes and lists the powerful collection of pain-related studies and statements produced in the last few years, including the ACCAHC Policy Brief, “Never Only Opioids: The Imperative for Early Integration of Non-Pharmacologic Approaches and Practitioners in the Treatment of Patients with Pain;” and the Joint Commission Revisions to Pain Management Standard, that became effective Jan. 1, of 2015. This is the final report of the policy symposium held Sept. 29, 2014 at the Georgetown University Conference Center. Leaders in integrative health and medicine presented on the status of and opportunities for the field and hosted a testimonial dinner for Sen. Harkin, to acknowledge his ground breaking initiatives on behalf of integrative health since the early 1990s. His comments are included here, with those of his colleague Sen. Barbara Mikulski who introduced him. The National Center for Complementary and Integrative Health (NCCIH; formerly NCCAM) issued a Request for Information early in 2015 as part of creating a five year strategic plan for 2016-2021. IHPC’s response here enumerates important shortcomings during the previous five years in which the Center did not involve CAM practitioners as directed by its enabling legislation and its own plan for the years 2011-2015. The FDA held two days of testimony on “Homeopathic Product Regulation: Evaluating the Food and Drug Administration’s Regulatory Framework After a Quarter-Century.” IHPC Executive Director Alyssa Wostrel presented this testimony at the hearing. In 2013, the Senate Appropriations Committee compelled HHS and other departments to correct an FAQ regarding Section 2706 that distorted the intent of the legislation and has compounded insurer non-compliance with the law. HHS issued a Request for Information in the spring of 2014. IHPC provided this reply (PDF: 14 pages with appendix). This conference was held in September 2010. The report documents discussions that occurred within the six conference workgroups, and outlines recommendations proposed by each workgroup. It also provides an update of activities that have occurred since the conference (see p.28). Beginning in April 2008 the Samueli Institute and IHPC’s Federal Policy Committee collaborated on a plan to bring prevention and integrative health to the forefront of America’s healthcare care reform efforts. The result was the Wellness Initiative for the Nation (WIN), which influenced the creation of the National Prevention Council created by the Affordable Care Act in 2010. The Coalition for Patients’ Rights (CPR) was created in 2006, initially in opposition to attempts to curtail the scope of practice of many healthcare disciplines by the American Medical Association and the Scope of Practice Partnership. IHPC and ACCAHC were both early CPR members.